The U.S. Department of Housing and Urban Development (HUD) generates the official list of wood-burning stoves that are approved for installation in mobile homes. Guidelines for stoves installed in mobile homes prior to June 15, 1976 were governed by state regulations. HUD is the official national code enforcement agency, and the HUD approval list preempts state requirements for installing wood stoves in mobile and manufactured homes. If HUD or the Federal Housing Administration (FHA) is the mortgage lenders for the mobile home, you can only install a wood stove that is HUD approved. HUD works with manufacturers to select wood stove models that meet safety standards set by HUD and the FHA. HUD views the installation of a new wood-burning stove as an addition, and you will have to obtain an appraisal to apply for approval to install the stove. HUD only approves freestanding, venting wood stoves, meaning that the stove must stand on legs and have a stovepipe that vents through a wall behind the stove to the outdoors. Zero-clearance stoves that are placed flush against a wall are not allowed for fire safety precautions; however, there are some HUD-approved models that only require a 4 1/2-inch clearance from the wall. Other models require a clearance of 9 inches or less. The Lopi Wood Stove company manufactures all stoves on the HUD list. 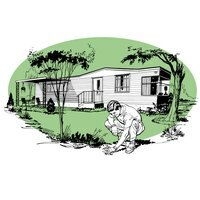 The list of approved models is short, and retailers are aware of models approved for installation in mobile homes and which models are not on the HUD-approved list. The Leyden top-loading model is one of few stoves made of all cast iron on the HUD list. It has a medium-size firebox and a 73,100 BTU/hour heating capacity. This stove can heat up to 2,000 square feet and has a maximum burn time of 12 to 18 hours. The top loading feature gives you the option to load logs from the top of the stove instead of having to open the front door of the firebox. The Lopi Endeavor model is a medium-size stove with a radiant surface for cooking and a convection surface for warming. It has one of the largest fireboxes but one of the lowest wall clearance requirements, needing only 4 1/2 inches from the back of the stove to the wall. It has a 72,400 BTU/hour heating capacity, and can accommodate 1,200 to 2,000 square feet of space, with a maximum burn time of 10 hours, and can hold logs up to 18 inches long. The Endeavor is one of few models on the HUD list that has a cooktop heating surface. Lopi’s “Answer” model is small and compact but has a 66,800 BTU/hour heating capacity. It requires a 9-inch clearance from the back of the stove to combustible surfaces, such as a wall. The Answer can heat 750 to 1,400 square feet and has a maximum burn time of 8 hours. The Liberty wood-burning stove is the largest stove on the HUD approved list and can heat 1,500 to 2,500 square feet of space, with a 74,300 BTU/hour heating capacity. It has a firebox big enough to hold logs up to 24 inches long and a maximum burn time of 12 hours. Like all HUD-approved stoves, the Liberty model has an overall energy efficiency of 70 percent, meeting HUD’s minimum efficiency requirement.